Promise Clinic alumnus Kiersten Frenchu, Class of 2017 was recently awarded a scholarship from the Melissa Anne Centrella Scholarship Foundation. 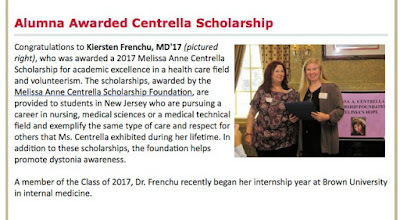 This scholarship is awarded to residents of New Jersey pursuing medical careers who demonstrate the same type and care for others that Centrella did in her lifetime. Below is a feature from the Dean's Newsletter. Congrats to Kiersten!